I feel very lucky to be sharing with you all my post for the Country Roads blog tour hosted by Allen & Unwin. Country Roads is a new novel by Nichole Hurley-Moore featuring a hard working farm girl and her gorgeous new author neighbour. This book is a lovely rural romance which highlights the beautiful Victorian countryside. Like many others, I grew up on fairytales. I loved them and still do, particularly the dark and twisty ones. As I got older the fairytales pushed me towards myths, legends, the Eddas, and ultimately romance. The old stories taught what it was to be a hero or a heroine but how do you translate that into a contemporary setting? In a modern setting there are no mythical beasts to slay hiding behind the hay bales. But our modern stories are just important as the old ones and they deal with many of the same themes such as loyalty, family, love and betrayal. Sometimes our modern heroes must fight a physical threat be it by nature or circumstance. Other times the demons they have to face are internal ones. This is the case for Matt Harvey and Bec Duprey from my latest book, Country Roads. Matt has to work his way through loss and grief before he has a second chance at life. And Bec must prove to everyone (especially herself) that she is capable of running her farm, Bluestone Ridge and learn how to trust her heart again. The compelling story of a grief-stricken man reeling from tragedy and a hard-working female farmer dealing with betrayal who may just find love and healing with each other. Rebecca Duprey is working day and night to keep the family sheep station, Bluestone Ridge, afloat. But Bec's father, who's been in a wheelchair since a farming mishap, keeps second-guessing her decisions. Now, to add Bec's woes, her unfaithful ex-boyfriend has started lurking around, and the adjoining farm she'd hoped to buy has been snapped up by a guy from the city called Matt Harvey. After leaving his job in advertising, Matt became a bestselling novelist. But since the death of his fiancee in a car accident, he's had severe writer's block and is desperately hoping his move to the country will help him deal with his grief and allow him to focus on completing his next book. Problem is, he seems to have started off on the wrong foot with his new neighbour, Bec Duprey. Bec isn't quite sure when she started feeling attracted to Matt, but she's determined not to succumb to his charms. And Matt isn't sure when his feelings changed about Bec; all he knows is he can't get her out of his mind. Can Bec and Matt overcome their fear of loss to find love and happiness with each other...? This absolutely compelling novel deals with betrayal, tragedy, love - and how first impressions aren't always right. Rebecca Duprey is doing all she can to keep her family’s farm afloat. It’s not easy single handedly running a sheep station especially with her father not trusting her advice and her former fiance nosing around. When author Matt Harvey moves in next door, Bec isn’t interested. She doesn’t have the time to spend on someone who may be back off to the city at any moment. Despite neither Matt nor Bec being interested in a new relationship, both of them are drawn to each other and they need to decide if being together is worth it. I really enjoy rural romance stories and Country Roads is a great one. The characters are engaging and I wanted to find out more about each one of them. The town of White Gum Creek was the perfect spot to set this novel with the countryside being as important to the story as the characters who lived there. The pacing of this book made the story all the more believable. Bec and Matt’s relationship grew over the course of months and the timeline felt right for them as people. With both characters having their own demons to overcome, they needed time to come to terms with their pasts and I felt the author gave them plenty of space to deal with their issues. One of the more interesting things about this novel is how character focused it is. Many contemporary novels I’ve read this in genre often have parallel storylines concerning mysteries or side romances. Whilst Country Roads does give us a little about Bec’s parents – it’s nearly all centred around Bec and Matt. We get to see their pasts, where they are now and what could be. I liked how focused it was on the lead characters but I also would have liked to have read a little more about the quirky townspeople who live in White Gum Creek. Country Roads is a compelling story about love in unexpected places and finding your place in the world. The characters made this book a page turner and the setting is picturesque. A must read for fans of Rachael Johns and Fiona McCallum. 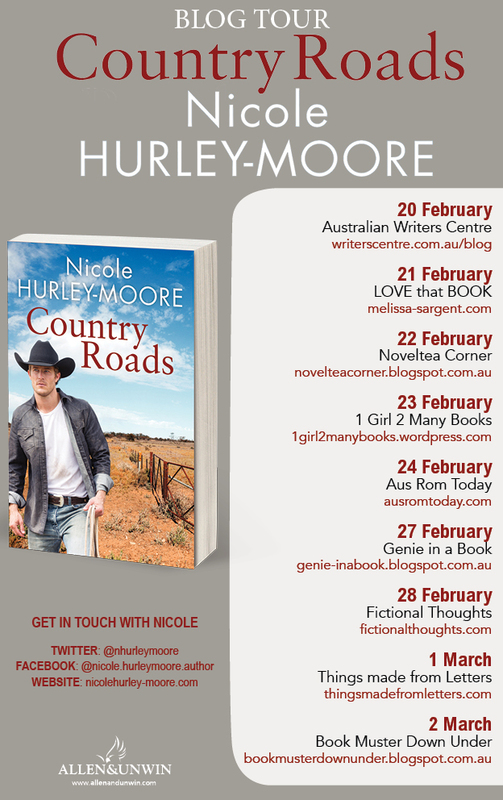 Country Roads by Nicole Hurley-Moore is published by Allen & Unwin, RRP $29.99, available now. Nicole Hurley-Moore grew up in Melbourne and has travelled extensively, whilst living her life through the romance of books. 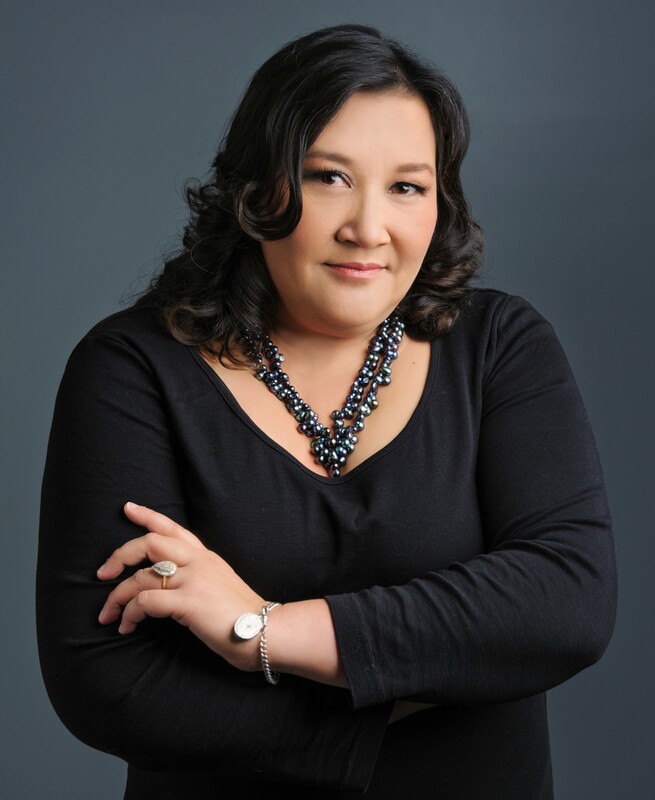 Her first passion in life has always been her family, but since doing her BA Honours in Medieval Literature, she has devoted her time to writing historical romance. Nicole is a full time writer who lives in the Central Highlands of Victoria with her family, where they live in the peaceful surrounds of a semi-rural town. She is the author of the immensely popular novels McKellan's Run and Hartley's Grange.